AIIMS Delhi Admit Card 2018: Staff Nurse, Group B, Nursing Officer – No doubt, earlier Admit Cards for 551 Vacancies or Nursing officer of AIIMS Delhi Institute i.e. All India Institute of Medical Sciences, New Delhi were supposed to be released online on 3rd September 2018. Although following some administrative reasons Admit Cards publishing was delayed and final Hall Tickets were made available on 4th September 2018 for an upcoming test of Nursing Officers. Thus, now AIIMS Delhi Admit Card 2018 can be downloaded from an official website www.aiims.edu. Online Application Form for this recruitment was started to be filled from 13th June 2018 to 12th July 2018 as the last date of registration. According to www.aiims.edu, an objective type question paper will be set by the Board which will contain General Awareness and Aptitude, General English, Basic Computer Knowledge and Nursing Informatics and Nursing subjects questions. For General English, applicants should not forget to go through error correction (phrase in bold), sentence completion, spotting errors, spelling test, transformation, passage completion, joining sentences, idioms and phrases, para completion, substitution, sentence improvement, synonyms, fill in the blanks antonyms, error correction (underlined part), active and passive voice, sentence arrangement and prepositions. On 1st September Board, Assistant Controller of Exams, AIIMS Delhi disclosed that due to unavoidable circumstances the admit card for the post of Nursing Officer 2018 will be uploaded on AIIMS website i.e. www.aiimsexams.org on 4th Sept instead on 3rd. 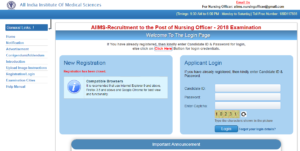 AIIMS Delhi Admit Card 2015 For Senior Resident Exam Released: Download Now!